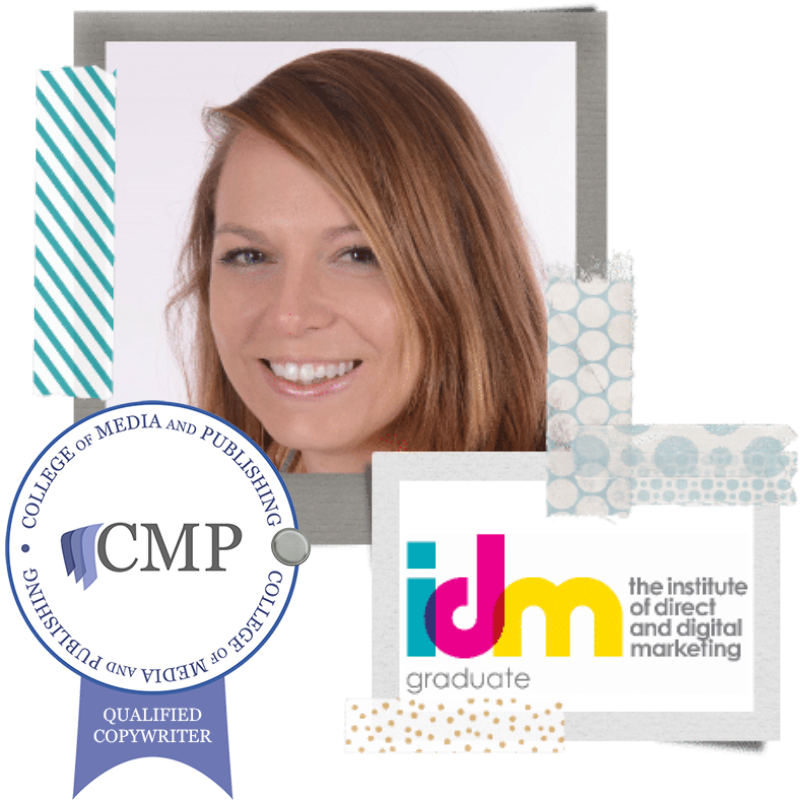 Need your very own tame digital copywriter in your toolkit? If you'd like to write your own online copy, but lack confidence, don't know how to structure content, or seem to suffer from permanent writer's block - I can help. 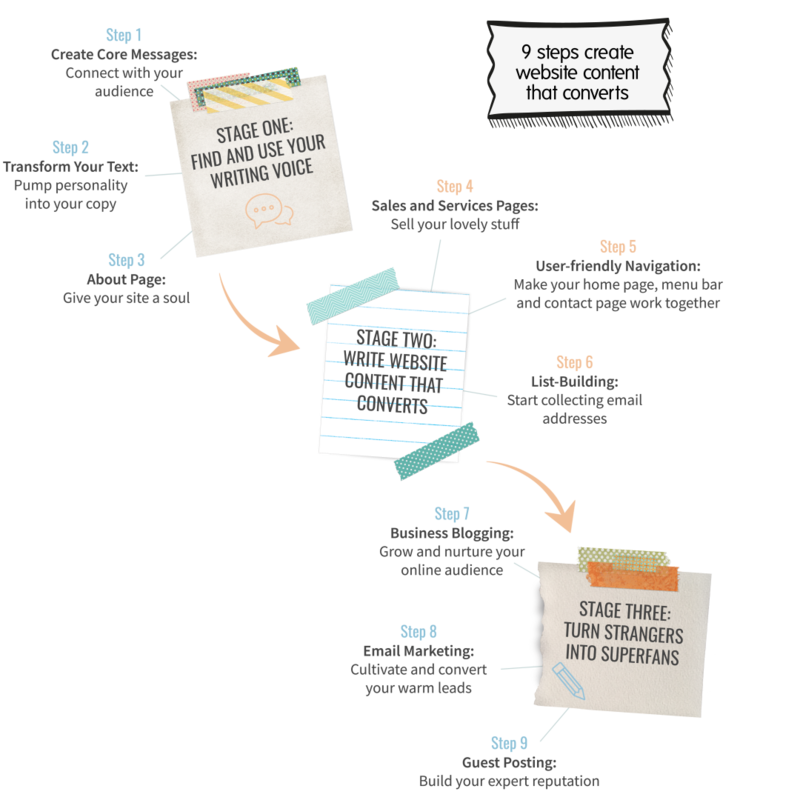 This service works best for entrepreneurs who want more than a DIY program, but don't want to outsource their content creation to a copywriter. You'll get access to every Write With Worditude course to create your website content, emails, blog posts and more. Send me your draft and I'll apply my professional touch. Plus drop into any of the live clinic video chat calls to speak with me face-to-face (via our screens). Access to every Write With Worditude course for as long as you subscribe to this service. Monthly live planning webinars, where together we will create a content marketing plan for the coming month (dates and times below). Copy-editing of any online content you write for your own business (includes website copy, blog posts, guest posts, bios), with a 48-hour turnaround. The process of writing content and receiving my feedback will quickly help you improve your online writing skills, and develop a consistent writing voice for your brand. Access to the small, private Wordidudes Facebook Group - a quieter, more intimate online space for my premium subscribers to connect with me and each other. Wondering how the Worditude VIPs make use of me? Here's a list of what we got up to on Monday 12th Feb.
* T got help outlining an email sequence to follow-up with leads she'd met at in-person events. * J had her new email sequence from freebie to tripwire reviewed by me - then jumped on the drop-in clinic call to discuss the changes needed. 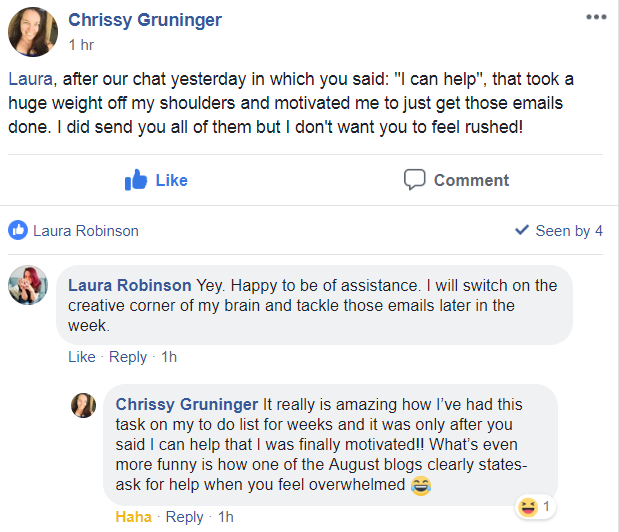 * M joined the drop-in clinic call so we could plan a sequence of emails from a freebie, to a tripwire product, to the main product (and beyond). 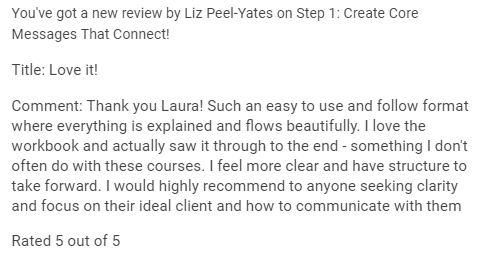 * K needed help with a sales page that was generating enquiries from all the wrong people - so I gave her a structure outline, and list of key components to include, so she can re-write it in a more targetted way. Worditude VIPs are welcome to subscribe to this service for as long or little as they want to, you aren't tied in (you just need to cancel the recurring subscription). I'm here to provide a more intensive level of support to help you achieve the next goal in your business, whether that takes one month or six. If you think this is a good fit for you, you can either subscribe right now or email me at laura@worditude.co.uk to find out more. Each month I'll go through the process I use to plan and create my online marketing content, so you can start the month knowing what you will publish through your social media, blog and email marketing. This isn't one-way teaching. You'll have the opportunity to ask questions, and stop me in my tracks if anything isn't clear. The Wordidudes is a small, exclusive group, so there's plenty of time for everyone to interact with me. And if you can't make the live call, all the recordings are available in a 'Bonus Content' area, exclusive to subscribers to this premium level of membership. Need to speak to me (rather than email or post in the group. No problem. VIPs can book themselves a 1-1 video chat via my online calendar. Every week I make a selection of times available so no matter what your time zone, we'll be able to meet (I have VIPs all over the world from Costa Rica to New Zealand). 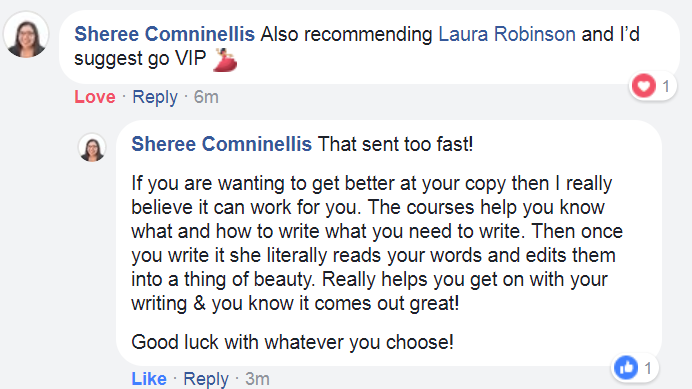 You can pay anywhere from $500 to $1000 for a do-it-yourself style copywriting course - but I wanted to deliver so much more. Helping other business-builders reach more customers is what I love to do. You've been brave enough to be your own boss - I want to do what I can to help you be a success. The courses are there to help you create your first drafts, put your thoughts into words and begin to develop your writing style. But the conversations and copy-editing are where the magic happens. ♦ Plan list-building pre-launch challenges. ♦ Name freebies, products, packages and even lunch clubs (coming up with names is one of my favourite things to do). ♦ Make changes to marketing emails to improve open and delivery rates. ♦ Plan blog, social media and email content for the month ahead. ♦ Make the most of guest posting opportunities. ♦ Simplify navigation via their menu bars and home pages, giving their visitors a much better user experience. ♦ Craft About pages that create instant connection with their target reader, and gently leads them along to the next stage in the customer journey. ♦ Clearly communicate their packages, products and services in a way that makes it easy for the right customers to say 'yes'. Add me to your box of tricks and you'll never struggle with your online content again. ...every Worditude course, plus recordings from previous webinars. Limited new spaces available each month. Apply for more info & a free no-obligation video chat. Turn strangers into superfans using the words on your website. Get access to every Worditude course, plus copy-editing support, and group calls with Laura. I want to be a VIP! If your messaging is in a muddle, I can help with that. And if your words tend to get in a jumble, I can straighten them out. Don't let your sales pages sell you short.